If you think suckers are just for kids, grow up! 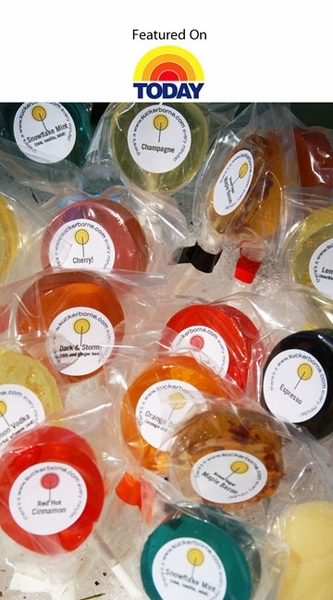 We create uniquely delicious suckers that combine the innocence of childhood with not so innocent flavors, like lemon vodka martini, maple bacon, (yes, you read that right!) and smooth rum and ginger. Our suckers are made with only premium quality, natural ingredients. We don’t use artificial flavors, preservatives, or anything yucky. Suckerborne delicacies have a kick that you just won’t find in wimpy mass-produced “pops.” Ours are handmade and wrapped in small batches to ensure you have the freshest, tastiest experience as you savor each and every sucker. So go ahead…..get Suckerborne and tell yourself it’s OK to love candy again! Start shopping by clicking on a flavor on the left!